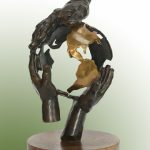 The Walden Woods Project Global Environmental Leadership Award recognizes significant achievement in the areas of climate stability, biodiversity, natural resource stewardship, human understanding, and global environmental policy. It draws its inspiration from the foundational thinking of Henry David Thoreau and builds upon his ageless principles of environmental stewardship, global interconnectedness, and personal responsibility. 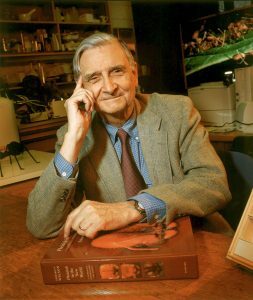 In his long and accomplished career, University Research Professor Emeritus at Harvard and this century’s most eminent biologist Edward O. Wilson (E.O. Wilson) spearheaded efforts to preserve the world’s biodiversity. He has led scientific expeditions to the far corners of the globe to document and advocate for the protection of the world’s “hot spots” of highest biodiversity, including the wild preserve of Gorongosa National Park in Mozambique, where he joined with Massachusetts philanthropist, Greg Carr, in working toward the park’s recovery after years of civil war. Dr. Wilson’s work has earned him more than 100 awards, including the National Medal of Science and two Pulitzer Prizes for Non-fiction. In 2000, he was named one of the century’s 100 leading environmentalists by Time magazine. E.O. Wilson’s new, highly-acclaimed book, Half-Earth, proposes an achievable plan to save our imperiled biosphere by devoting half the surface of the Earth to nature, thereby protecting 85 percent of species from extinction. Half-Earthoffers an attainable goal we can strive for on behalf of all life. Our survival is inextricably entwined with the survival of all species that call our planet home. Yet, our current destructive trajectory is resulting in mass extinction of species and irreparable damage to our world. With his Half-Earth call-to-action, E.O. Wilson has inspired a “moonshot” and created the groundwork for one of the grandest conservation efforts of our time, the Half-Earth Project (https://eowilsonfoundation.org/). In 2017, the Walden Woods Project recognized four organizations, two in partnership, that have focused on unique environmental challenges at a local, regional or national level.These Challenge Awards highlight a focus of purpose and effort that has allowed the recipient to create new opportunities and solutions to a specific pressing question. Their efforts serve as a model for others who would face similar challenges and who seek an effective, constructive and sustainable outcome. As such, they represent many others who could be similarly recognized. 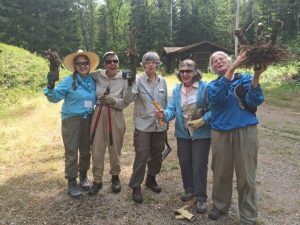 Great Old Broads for Wilderness is a national grassroots organization, led by elders, that engages and inspires activism to preserve and protect wilderness and wild lands. Founded in 1989 by feisty older women who love wilderness, Broads gives voice to the millions of Americans who want to defend their public lands for future generations. Today the organization has 40 grassroots chapters led by volunteers across the nation — called Broadbands or bands of Broads. The organization emphasizes four core activities: education, advocacy, stewardship, and fun—training and empowering women as conservation leaders. They bring knowledge, commitment, and humor to the conservation movement. They work to keep wild lands wild and the Wilderness Act intact, to keep public lands in public hands, and to make public lands part of the solution to climate change. Learn more about Great Old Broads for Wilderness at www.greatoldbroads.org. Launched in 2013, Green Leadership Trust works to build an environmental and conservation movement that wins. They are a network of people of color and indigenous people who serve on the boards of environmental organizations, and are guided first and foremost by their responsibility as fiduciaries of the organizations they represent. Green Leadership Trust is unique in a number of ways because they are the first cross-organizational effort focused on building power and diversity in any advocacy sector. 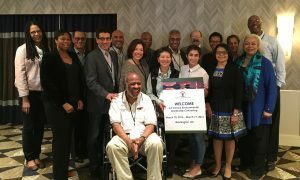 Their work is focused on building a more powerful environmental movement by expanding the impact and leadership of people of color and indigenous people serving on these boards. Learn more about Green Leadership Trust at www.greenleadershiptrust.org. Fenway Farms is a 5,000 square foot rooftop farm sited within Fenway Park, from which more than 6,000 pounds of organically grown, fresh produce are harvested each growing season. Installed and launched for opening day of the 2015 season, Fenway Farms provides vegetables and fruit to Red Sox fans dining at Fenway Park’s EMC Club restaurant. 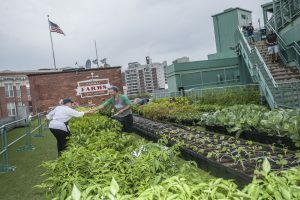 Maintained by the farm team at Green City Growers, Fenway Farms is helping to make America’s most beloved and oldest ballpark also one of America’s greenest. Green City Growers transforms unused space into thriving urban farms, providing a broad range of clients with immediate access to nutritious food, while revitalizing city landscapes and inspiring self-sufficiency. GCG works with corporate clients, retailers, schools, and residential properties to install and maintain organic edible landscapes ranging from raised-bed installations and small scale production farms, to the rooftop farms at Whole Foods Lynnfield and Fenway Farms. 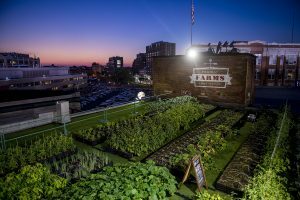 They envision a world where rooftops and vacant lots become common and productive places to grow food – an agricultural revolution for a healthier nation, where people throughout urban areas will have access to a network of sustainable farms, fueling personal and environmental health, and local food sustainability. The Boston Red Sox were established in 1901. Originally known as the Boston Americans, the team played its home games at the Huntington Avenue Baseball Grounds in Boston before adopting the name Red Sox prior to the 1908 season and moving to Fenway Park in 1912. The Sox captured the first ever World Series in 1903, and have gone on to win eight titles in all, as well as five additional American League pennants. Today the Red Sox are led by owners John Henry, Tom Werner, and their partners, who purchased the team in December of 2001. Under their watch, the club created the longest sellout streak in major league baseball history, renovated and preserved Fenway Park, and won three World Series Championships, the first in 2004 which ended an 86-year stretch without a title. Learn more about Fenway Farms at http://greencitygrowers.com/fenway-farms/. Learn more about Green City Growers at http://greencitygrowers.com/. Learn more about the Boston Red Sox at https://www.mlb.com/redsox. He is an ardent conservationist and environmentalist, a man who stands for social responsibility and political involvement and an artist and businessman who is a staunch supporter of uncompromised creative expression. His life-long passion for nature and issues of justice has resulted in Redford being widely acknowledged as a highly effective and dedicated political and environmental activist. Redford has received numerous awards for his environmental work, including the 1989 Audubon Medal Award and the 1987 United Nations Global 500 Award, the 1993 Earth Day International Award and the 1994 Nature Conservancy Award. He was also the recipient of the 1997 National Medal for the Arts by President Clinton and the 2001 Freedom in Film Award presented by the First Amendment Center. He was honored with the 2002 Pell Award for Excellence in the Arts: Lifetime Achievement Award and the 2004 Forces for Nature Lifetime Achievement Award from the Natural Resources Defense Council (NRDC). In December 2005, Redford accepted the Kennedy Center Honors for his “distinguished achievement in the performing arts and in recognition of his extraordinary contributions to the life of our country.” And, in 2011 he was named Conservationist of the Year by the National Wildlife Federation. 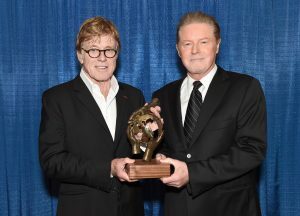 The Walden Woods Project is proud to present its second Global Environmental Leadership Award to Robert Redford. In 2014, the Walden Woods Project recognized one individual and three organizations that have focused on unique environmental challenges at a local, regional or national level. 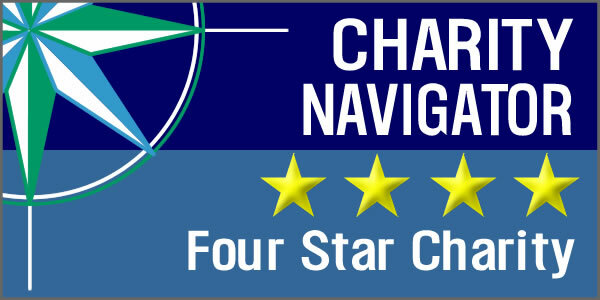 These Challenge Awards highlight a focus of purpose and effort that has allowed the recipient to create new opportunities and solutions to a specific pressing question. Their efforts serve as a model for others who would face similar challenges and who seek an effective, constructive and sustainable outcome. As such, they represent many others who could be similarly recognized. The Student Conservation Association (SCA) empowers America’s young people to plan, act, and lead while making a tangible impact in conserving our nation’s natural and cultural resources. 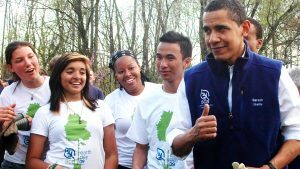 Engaging youth from diverse backgrounds in hands-on service to the land, SCA protects and restores national parks, marine sanctuaries and urban greenscapes in all 50 states. This practice also yields an additional impact on the individual, as studies show the SCA experience promotes personal growth, inspires lifelong stewardship, and provides a pathway to productive careers. The nation’s first and largest youth conservation corps, SCA was founded in 1957 by Liz Putnam. A recent college graduate at the time, Liz first proposed the idea of a “Student Conservation Corps” two years earlier in her senior thesis. From there, SCA launched a nationwide youth conservation movement and this summer the organization marked a milestone by deploying its 75,000th member. Accepting the Award on behalf of the Student Conservation Association were Kevin Hamilton, Vice President for Communications, and Sophia Bass-Werner, SCA Alumna and UMass Boston student. For further information, visit www.thesca.org. Deepika Kurup is a junior at Nashua High School South. She has been passionate about solving the global water crisis ever since she was in elementary school, as she was exposed to the water problem at a very early age. Deepika developed a novel pervious composite that filters water, and harnesses sunlight to purify water through a process known as photocatalysis. Her method is a green, sustainable and cost-effective technique for degrading organics and destroying bacteria in wastewater. Earlier in 2014, she was honored at the White House with the United States President’s Environmental Youth Award from the Environmental Protection Agency. 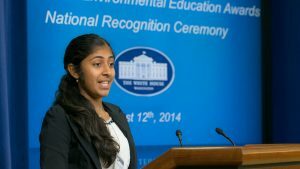 Also in 2014 Deepika was the national winner of the U.S. Stockholm Junior Water Prize. 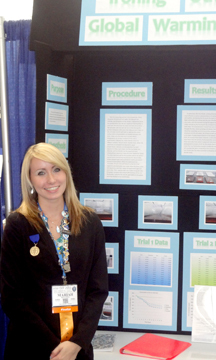 She was also invited to present at the 2013 White House Science Fair. 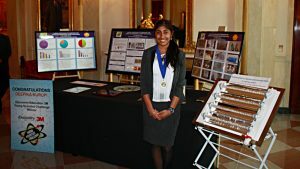 In 2012, Deepika was named “America’s Top Young Scientist” after winning the grand prize in the Discovery Education 3M Young Scientist Challenge. In her free time, she enjoys giving talks and writing articles to encourage students all around the world to pursue science, technology, engineering and math, and to increase awareness of the global water crisis. Deepika is also an ardent fan of martial arts and has a black belt in karate and taekwondo. Deepika’s guests at the award dinner were Pradeep Kurup, her father; Meena Kurup, her mother; and Anjali Kurup, her younger sister. The Sky Islands are a world-renowned hotspot for wildlife diversity. In this unique place, mountain islands meet a sea of grasslands and deserts, creating habitat for a mosaic of native plants and animals – from the magnificent jaguar and white-nosed coati to the elegant trogon. However, the Sky Islands and the life they support are increasingly threatened by disappearing habitat, a hotter and drier climate, increasing border issues, and growing pressures from development. Sky Island Alliance is a bi-national organization dedicated to protecting and restoring native plants and animals and wildlife habitat in southern Arizona and New Mexico and in northwestern Mexico. 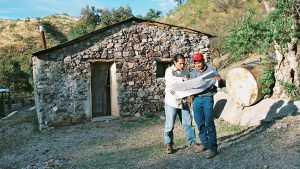 The organization protects and restores biological diversity through citizen science and reconnecting people to nature. Sky Island Alliance has put this vibrant region on the map of global conservation priorities. Being the first to document ocelots alive and wild in Arizona, and documented evidence that ocelots are breeding in the region, with a photograph of a female and kitten in Sonora, Mexico. 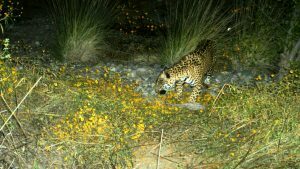 Verifying two jaguars living in the Sierra Azul Mountains, just south of the Patagonia Mountains in Arizona, and identifying jaguar tracks in the Santa Rita Mountains of Arizona. In cooperation with local landowners, restoring a critical corridor for migratory birds, including elegant trogons, ruby-throated hummingbirds, and the endangered Southwestern willow flycatcher and yellow-billed cuckoo. Accepting the Award on behalf of Sky Island Alliance was Jan Holder, Executive Director; Sergio Avila, Northern Mexico Conservation Program Manager; and Jessica Moreno, Wildlife Linkages Program Coordinator. For further information, visit www.skyislandalliance.org. In Rwanda, 44% of children under the age of five are chronically malnourished, despite the fact that 85% of Rwanda’s population is engaged in agriculture. Gardens for Health works to bridge that gap. The organization operates at the nexus of agriculture and health to provide lasting solutions to chronic childhood malnutrition. 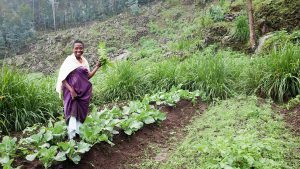 Its approach pushes medical interventions beyond clinic walls and into home gardens and communities, demonstrating the crucial role agriculture can – and must – play in addressing malnutrition on a global scale. 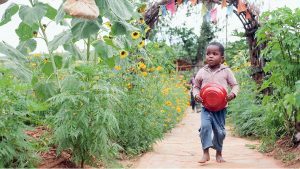 To date, Gardens for Health has worked with over 1,900 families, helping to ensure that 7,600 children have the healthy food they need to grow and thrive. Its work is having a measurable impact on the families it serves: one year after enrolling in the Gardens for Health program, 71% of children are at a healthy weight. This year, Gardens for Health is looking beyond Rwanda’s borders, and sharing its home garden model and training methodology with NGO partners in Uganda and Burundi. Accepting the Award on behalf of Gardens for Health International were Jessie Cronan, Executive Director; Emma Uwodukunda, Health Manager; and Conner Wear, Agricultural Technical Manager/Farmer. For further information, visit http://www.gardensforhealth.org/. 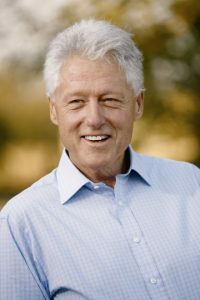 In 2006, President Clinton launched the Clinton Climate Initiative (CCI) to address the core issues driving climate change by working at the invitation of city and national governments and with businesses around the world. CCI creates programs to reduce greenhouse gas emissions that are both economically and environmentally sustainable. CCI’s programs work to increase accessibility and deployment of clean energy, reverse deforestation, and reduce carbon emissions in cities and communities. By partnering with the C40 Climate Leadership Group, CCI has created a network of cities around the world that are taking action on combating climate change. Across all of its programs, CCI uses a holistic approach to address the major sources of greenhouse gas emissions and the people, policies, and practices that impact them. To date, CCI has helped to cut or abate more than 2 million tons of greenhouse gases in some of the world’s largest cities annually. The Walden Woods Project is proud to present its first Global Environmental Leadership Award to President Bill Clinton. In 2012, the Walden Woods Project recognized four individuals or organizations that have focused on unique environmental challenges at a local, regional or national level. Anthony Choquette will enter his senior year at Lawrence High School in Lawrence, Massachusetts this fall. 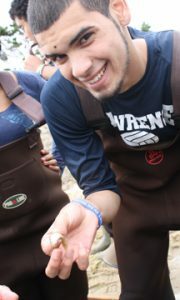 Anthony’s self-motivation and deep interest in environmental issues has led him into a wide range of activities. 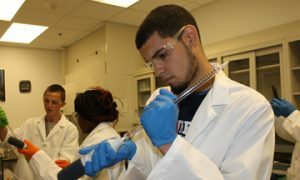 He has rapidly moved through the available curriculum from freshman Honors Biology to AP Biology in his junior year. from working for three years on the Spicket River Cleanup, to leading Lawrence High School’s recycling program. Last year, he collaborated with the EPA on water quality monitoring for the Shawsheen River gaining information on potential sewage leaks. This initial project has led to an ongoing monitoring program that will report to the EPA on regular intervals. 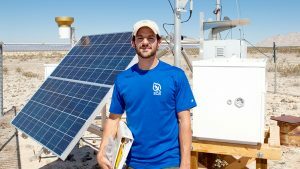 Beyond the immediate environmental impact, the project provides a valuable teaching opportunity for Anthony with his fellow students. Anthony’s guests at the award dinner were Christal Rydle, Anthony’s Mother; Rebecca Veilleux, Lawrence High School Biology Teacher; Michael Fiato, Lawrence High School Principal; Heather McMann, Executive Director of Groundwork Lawrence. Mariah Rendeiro will be a senior at Granbury High School, 40 miles southwest of Fort Worth, Texas. With her project “Ironing Out Global Warming,” Mariah was one of three students selected to attend The International Environment and Sustainability Olympiad in the Netherlands in May, 2013. Mariah’s science project focused on iron fertilization wherein she tested three different iron compounds to determine which, if introduced into an aquatic environment, would cause the greatest decrease in CO2 levels. She hypothesized that the iron nitrate would be most beneficial because both iron and nitrogen would be useful to phytoplankton. The outcome of her experiment concluded that this was the case. In her experiment, the iron nitrate compound proved the most effective at carbon sequestration in its contained atmosphere, decreasing the CO2 levels by nearly 50%. Encompassing over 27,000 square miles in Arizona, New Mexico & Utah, the Navajo Nation is geographically the largest Native American nation in the U.S. (larger than West Virginia). In 1967, operations began with two strip mines on Black Mesa in Arizona – the Kayenta & Black Mesa coal mines. Collectively, these mines constituted the most extensive strip mining operation in the United States. In addition to unrealized jobs, the mines have left a legacy of polluted air and land, contaminated and depleted water, and various health ailments. The closing of the Mojave Generating Station and the Black Mesa Mine. 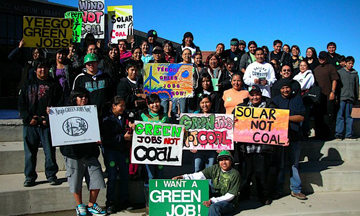 The establishment of the Navajo Green Economy Fund and Commission. The establishment of the Southwest Indigenous Leadership Institute. The bringing together of Navajo and Hopi communities and organizations in the development of a collective long-term vision for the region. Current ground-breaking projects include the Black Mesa Solar Initiative, which aims to utilize the abandoned mine land of Black Mesa for a large scale solar installation; and the Navajo Wool Market Pilot Project.